This is the 22nd of our weekly round-ups of blasphemy news and views. Following on from last week’s late-breaking news that nine men were convicted of “blasphemy” and sentenced to death in Kano state, there have been a few developments in the past seven days. The Kano state government has expressed satisfaction that the rule of law was allowed to triumph in the case of a recent judgment by an Upper Shari’a Court, Rijiyar Lemo, in the state, which passed death sentences on nine persons for blasphemy against the Prophet Mohammed (SAW). The government noted that the judgment is a clear pointer to the fact that whoever breaks the law of the land will not be spared. It then appreciates the patience and the calmness with which the general public allowed the law to take its course despite the unwarranted provocation. …The statement further hopes that this will serve as deterrent to those who feel they can come and course a breach of the peace and further justifies government’s resolve to look into the existing law which provides for the regulation of preaching and preachers in the state through the State House of Assembly. The hashtag #SaveKanoNine trended on Twitter in Nigeria. And partners in the End Blasphemy Law campaign, the International Humanist and Ethical Union and the Nigerian Humanist Movement wrote to authorities in Nigeria, to protest the verdict. 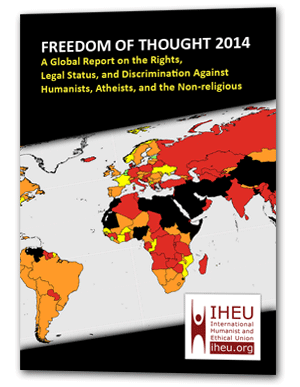 IHEU and the Nigerian Humanist Movement raised a series of objections to the sentencing on human rights grounds, both against the charge of “blasphemy” and the death sentence in principle, as well as highlighting the particular circumstances of the case that constituted a violation of the right to a fair trial. 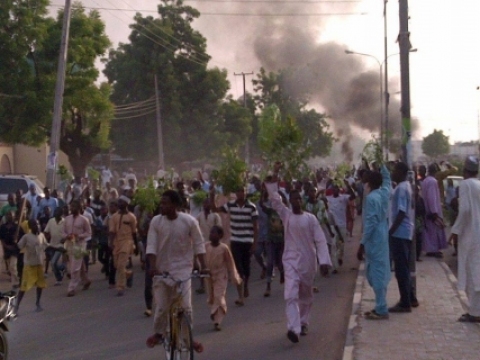 The condemned men were arrested following accusations in May that their religious celebrations honouring the founder of their sect were “blasphemous”, prompting riots in Kano, with a large number of Muslim men rallying against the accused and setting fire to a building. An Upper Sharia Court has subsequently upheld the convictions and parts of the Kano population are said to be “jubilant” at the verdict. Read the full open letter. Iceland voted to legalise blasphemy yesterday after a bill was brought to parliament by the country’s Pirate Party. Previously under Icelandic law anyone found to be “ridiculing or insulting the dogmas or worship of a lawfully existing religious community,” could be punished with three months in prison or a fine. “The Icelandic Parliament has issued the important message that freedom will not bow to bloody attacks,” the party said in a statement released to The Iceland Monitor after the successful vote. The measure was broadly supported by most political, religious and public figures – despite the ambivalent relationship much of Iceland’s establishment has with the Pirate Party. represents a rare successful intervention by authorities in a country where even unproven allegations of blasphemy can result in a bloody death at the hands of vigilantes. Sohail Zafar Chattha, the district police chief, told AFP the illiterate Christian couple had obtained an old panaflex advertisement awning which contained the names and slogans of various colleges, which they were using as a mat to sleep on in their home. Arabic inscriptions, allegedly from the Koran, were found among the colleges’ slogans, leading one local barber as well as two religious leaders to accuse the couple of committing blasphemy. “Muslims of the town gathered there and dragged the poor couple who didn’t know what they had done. They were being beaten to death,” Chattha wrote on Facebook. “Police intervened in time and rescued the couple from the mob and shifted them to Lahore and handed over them to the elders of Christian community,” he later told AFP. Police have arrested one of the religious leader while the other and the barber remain at large, he said. Some residents interviewed by the police said the barber may have been interested in obtaining the couple’s house. Nadeem Anthony, a Christian human rights lawyer, hailed the police action. “It is a positive development that the police is taking its duty seriously and protecting the accused in such cases,” he said, adding he could recount three other instances where authorities had stepped in in time. “If the state and its organs continue to perform their duties, the elements who take the law into their own hands will be discouraged,” he added. Trouble flared after Owais Qamar, a Christian laborer, found a banner by a roadside and took it home to use as a carpet, police said. The banner had the logo of the University of Sargodha with the words Hadith (Oh my Lord, increase me in my knowledge), written on it. A Muslim woman, Kaneezan Bibi, accused the family of blasphemy after seeing the banner in the family’s home during a visit. Soon after, a mob beat Qamar, his wife, Rukhsana, and sister-in-law Rehana. Two village guards then shaved their heads and paraded them through the village on donkeys, an act of humiliation practiced in Pakistan, police said. The Electronic Frontier Foundation has pointed out the hypocrisy of Iranian leaders using social media in a country where Facebook and Twitter have been suppressed for two years, and numerous people face trials and jail time for their internet use. Iran’s recent treatment of average citizens who use social media suggests an alternative vision. In February, twelve Iranian Facebook users were arrested on charges of “spreading corruption, and [carrying out a] mission to change family lifestyles.” Eight more Facebook users werearrested last year on a variety of charges, including blasphemy, propaganda against the ruling system, and insulting the country’s supreme leader, and given sentences of between seven and 20 years in prison. Soheil Arabi, was sentenced to death in 2014 for “insulting the prophet of Islam” on Facebook. According to Iranian news sources, the Supreme Court reviewed Soheil Arabi’s death sentence and decided to cancel it. While Arabi remains in prison, his successful challenge of the death penalty is cause for celebration. However, the local news reports suggest that corporal punishment may still be on the cards, and Arabi does remain behind bars! New Zealand: Is this a new blasphemy law by the backdoor? A similar risk arises from the prohibition on a communication that may be “grossly offensive to a reasonable person in the position of the affected individual”. It does not take much imagination to see how that provision could be used by a deeply religious person to resurrect blasphemy laws that have largely (and properly in a secular society) fallen into disuse. A complainant will not be able to obtain any redress unless he or she can show that the offending digital communication has caused harm. But harm has also been given an alarmingly expansive definition by the statute. It is defined as anything that causes a complainant “serious emotional distress”, a disconcertingly subjective notion. After it passed by a 116-to-5 vote in New Zealand’s parliament, Gareth Hughes, one of the four Greens MPs to vote against the bill, said it was overly broad and “risks limiting our freedom of expression”. NZ Labour said it was “wedged” by the NZ government: while some of the bill was “worthy of discussion” the law has “deeply worrying” elements. … There’s a safe harbour provision for Web sites, and here’s where the free speech arises. A platform like Facebook or Twitter (if they bothered) can opt into the safe harbour – but only if they agree to remove allegedly offending material either on-demand or within the bill’s 48-hour grace period. New Zealand’s National Business Review notes complaints that it could criminalise children over the age of 14. The Prisoners’ List of Human Rights Without Frontiers country by country comprises prisoners whose activities were exclusively related to freedom of religion, i.e. freedom to change religion, freedom of association, freedom of worship and religious assembly, freedom to share one’s beliefs, conscientious objection to military service. A separate section has been created to cover the misuse of so-called antiblasphemy laws restricting freedom of expression related to religious issues. Though the short “blasphemy” section is far from an exhaustive list, covering only four of the many countries with “blasphemy” laws and indeed with blasphemy prisoners, it’s a useful resource, and the combined prisoner index runs to nearly 150 pages even without covering every country. Lawyer Mamdouh Abdel-Gawad, who had filed the case against Beheiry in the first place, filed an appeal against the acquittal with the general prosecution on Saturday. The prosecutor is yet to rule on the appeal request. Last May, in a separate case filed by another lawyer, Mohamed Abdel-Salam, El-Beheiry received a five-year sentence, also on charges of blasphemy. The TV presenter appealed the verdict and was released on bail. 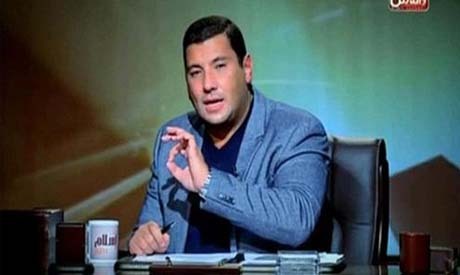 Up to 48 legal complaints have been filed against El-Beheiry over views he expressed on his show, With Islam. In April, Egypt’s highest Sunni authority Al-Azhar also filed a complaint with Egypt’s General Authority for Investment and Free Zones requesting it stop airing El-Beheiry’s show. Al-Azhar accused the presenter of leading a “fierce” campaign against the foundations of Islam and Islamic heritage. Shortly afterwards, Al-Kahera Wal Nas cancelled the show. The British Humanist Association yesterday welcomed to London Rafida Bonya Ahmed, the widow of murdered writer Avijit Roy. Roy is one of three “atheist bloggers” assassinated this year alone apparently for having dared to criticise Islamic leaders or ideas. The Bangaldeshi Government has, explicitly at the request of Islamist parties, pursued atheist bloggers through the courts and jailed them under the ICT Act for “insulting religious sentiments”. Bonya Ahmed has delivered the 2015 Voltaire Lecture, hosted by the British Humanist Association, in London tonight to a packed audience of fellow humanists and free speech advocates. In a Q&A after the lecture she said she “reserved judgement” on news that Bangladeshi’s Rapid Action Battalion (RAB) (widely criticized as a “government death squad”) had arrested 12 members of an alleged al-Qaeda terror group in connection with the murders; she expressed skepticism about the timing of the arrest and the nature of the group – which is so dissimilar to previous arrests made in connection with the murder of Washiqur Rahman. Yesterday our partners the International Humanist and Ethical Union also lodged their human rights concerns relating to Bangladesh at the UN Human Rights Council. In a written statement to the UN Human Rights Council, the IHEU raised its serious concerns about the situation for those who seek to express their criticism of political Islam, Islamism, or religious militancy, who advocate secularism, or who identify as atheist in Bangladesh. Over the past few years there has been a pattern of vicious attacks specifically targeting Bangladesh’s secular / atheist blogging community, which the state authorities seem either unable or unwilling to prevent. …The Government of Bangladesh has not only failed to offer public condolences to the families of the murdered bloggers this year, but it has taken the opportunity to reiterate that existing laws are sufficient to punish anyone who attempts to insult religion. Under the existing cyber laws in Bangladesh, a person can be jailed for up to 10 years if convicted of defaming a religion online. We called on the Human Rights Council to put pressure on Bangladesh to urgently bring to justice those responsible for the brutal attacks, and to make clear that attacking freedom of religion and expression will not be tolerated. Contrary to its actions so far, we also called on Bangladesh’s Government to make a clear and public statement clarifying that the right to freedom of religion or belief applies to those with no religious belief as well – we argued that the importance of the country’s leader recognising atheists as moral agents in possession of the same rights as religious citizens should not be underestimated. …back home in Pakistan, Qadri proudly takes ownership of formulating Pakistan’s blasphemy law, which has been abused to suffocate and intimidate religious minorities through blatant mob violence. When addressing western audiences, Qadri claims that the blasphemy law does not apply to non-Muslims. Back home in Pakistan he has advocated ‘killing blasphemers… like dogs’. This video highlights his contradictory stance on the blasphemy law, and showcases his claim that he incorporated section 295-C to the Pakistan Penal Code which sanctions the death punishment for defiling Islamic scriptures or insulting Prophet Muhammad. 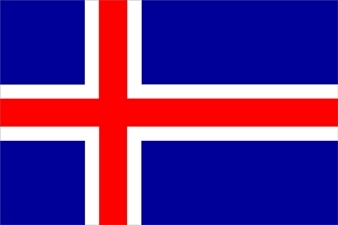 ← Blasphemy Law Abolished in Iceland!